"3MI6, Upper Burial No. 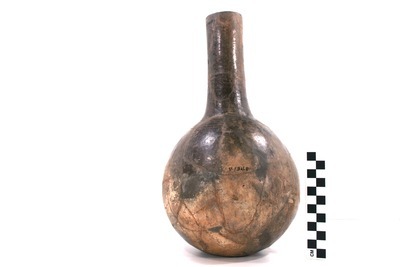 1, Vessel 1348; 5425.2207" by Timothy K. Perttula and Robert Z. Selden Jr.
DECORATION (INCLUDING MOTIF AND ELEMENTS WHEN APPARENT): The upper part of the vessel body has six closely-spaced horizontal engraved lines. Hickory Engraved bottle, Vessel 1348.